Steranko Cover Radical Comics' "Hercules"
Dragon Con is held in annually in Atlanta over the Labor Day weekend, with more than 20,000 science fiction, comics and gaming fans in attendance. One of the highlights of the four-day festivities is the Saturday night awards banquet. Since 1998, the Julie Award has been bestowed for universal achievement spanning multiple genres. Past honorees include diverse personalities such as comics pioneer Will Eisner, rock musician Alice Cooper and fantasy author Anne McCaffrey. 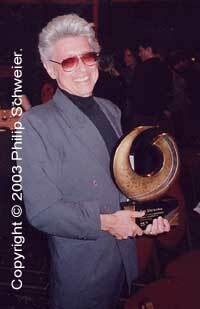 Among this year's honorees was comics pioneer Jim Steranko. In accepting the award from Julie Schwartz, Steranko explained how as a young artist, he paid a visit to the DC offices one afternoon. Most of the staff was at lunch, but Julie was there. "Well, he took me into the office, and walked me through the offices, there were some guys working there, laying out pages. He introduced me to maybe half a dozen people. "Anyway, we talked for maybe 40 minutes, which is a treat of a reception, because for some geek just to walk in off the street, and talk to somebody like Julie Schwartz is really something." Julie gave him a copy of the script for Adam Strange: Man of Two Worlds to study, saying that if he got half of it, he could be a pretty good comics artist. "At that moment, that Julie took some kid - and Julie doesn't remember this, by the way - he doesn't remember this because he had done this hundreds of times, but the kindness that he showed me in that very moment changed my life, (otherwise) I probably wouldn't be here talking to you today." That moment didn't just change the life of a young artist, it altered indelibly the direction of comics. Steranko's entrance into the world of comics heralded new ways of telling a story, dynamic new designs in illustration and layout, and paved the way for more ambitious formats such as the graphic novel. When I was about 9 years old, my sister told me they had comic books at the public library. I didn't believe her until she showed me a couple of books in the adult section. Big, tall books, with more super-heroes on the cover than I could have ever imagined. Newer characters from Marvel, longtime legends like Superman, some nearly-forgotten ones like the Green Hornet, and some I had no idea who they were. 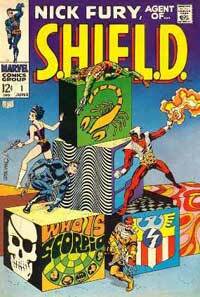 The books in question were Steranko's History of Comics. I read and re-read these books over and over again. When they were due back at the library, I renewed them, again and again. I did this so often that eventually the librarian called me to ask me to bring them back, because other people might like to read them too. I did, but about six months later, I had them out again. Nowadays, I have my own copies (thank you, Bud Plant). 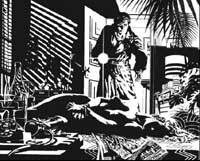 The books touched on the roots of comics in the pulps, citing such characters as Doc Savage and The Shadow. I knew who The Shadow was. He had been featured in Batman #253, and I figured anyone who could inspire a super-hero legend like the Caped Crusader was worth looking into. Fortunately for me, Jove was beginning to reprint some of The Shadow stories in paperback, and who should be doing the covers? Jim Steranko. Wherever I went in the realm of comics fandom, Steranko was there - from chronicling the past with his History of Comics, to building toward the future with revolutionary visions of Captain America. He has illustrated some of the greatest heroes of the 20th century, such as Sherlock Holmes, Philip Marlowe, and Indiana Jones. But he has always been observant of the here and now, by publishing such magazines as Mediascene and Preview, feeding the insatiable hunger of fan boys everywhere. After all, who among us consumed with comics hasn't also been interested in science fiction films? While I stood in line waiting to meet this man whose name has been ubiquitous in comics ever since I learned to read, illustrator Bill Sienkiewicz came over long enough to say hello to him. "Jim, you're the best dressed man in here," Bill told him. And he is, looking sharp in a double-breasted two-piece suit with a turtle neck shirt. Everyone else, including comics professionals, are wearing golf shirts, or t-shirts with some super-hero logo on them. I patiently waited, as he continued to sign anything put in front of him, and chat with fans, and tell stories of working for Stan Lee. The woman in front of me had a rather battered copy of one of his comics, and apologized for not taking better care of it. "Hey, it's been well-loved," he told her appreciatively. Finally my turn came, and he was impressed that I had a copy of his hard-to-find Chandler book, one of the earliest graphic novels. Jim O'Barr, creator of The Crow, interrupted, as they got to talking about movies, and how hard it is to draw Robert Mitchum. It was a long wait for me, but after 30 years, anything else seems insignificant. Steranko got back to signing some of the things I'd brought, and we talked some more. Once my items were autographed, Steranko continued to entertain anyone who would listen, but with the line growing behind me, it was time for the next person's turn. I thanked him, we shook hands, and he looked right at me. Not me, Fanboy # 987 of the day, but me, a person, and he said, "Look, you come back later on, we'll talk some more." He was very quiet about it, as though it were a personal invitation. I'm sure he said it to many fans that weekend, but so what? It's not about how he connects with one person, but how he connects with the comic book community as a whole. The kindness and generosity Julie Schwartz showed him more than 30 years ago lives on in the warmth and friendliness of Jim Steranko. Judging by the number of people in line over the entire 4-day Dragon Con, there is no way of saying how many future comics professionals were extended that same courtesy, and will go on to pass it along to future generations.. Praise and adulation? Scorn and ridicule? Email me at philip@comicbookbin.com. Are Trade Paperbacks the Future of Comics? Why Kids Don't Read Comics?